Messi’s injury means that the Blaugrana will be without their leader for a few weeks. This is the time for both the manager and the players to step up. They must seize this opportunity and make the most of it. 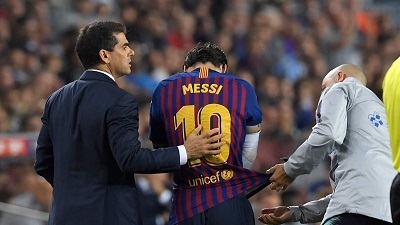 Rarely is an injury a blessing in disguise, but perhaps Messi’s injury can be used by Valverde and the players to step up and be less dependent on Messi. Messi’s injury is a short-term injury but the Blaugrana have the talent to be good and be competitive. For far too long, we have heard that Barça is reliant on Messi and cannot function without him. Well, he will be absent for today’s Champions League clash against Inter and for this weekend’s El Clasico. Although we would prefer he was playing in these games, his absence cannot be used as an excuse. Although we may deem him as Immortal, Messi is still human and can suffer injuries. If he suffers another injury in the future, and hopefully not an injury that rules him out for a lengthy period, then this would be preparation for the day that we hope that never comes. It’s time for the players to stop hiding and time to shine. Dembélé can play on the right, which is his preferred side, so he has no excuse now not to play there, unless Valverde says otherwise. Folks have said Coutinho plays in the same position as Messi, then it’s time for him to show it. Midfielders cannot rely on passing the ball to Messi and watch. Defenders need to be more alert and stop leaking goals. Valverde must adapt from being conservative whenever the team has the lead and just go for the kill. He has the weapons. It’s high time he used them and what better time than now. Messi is irreplaceable, but this team can manager without him in the short term. Hopefully they will not use Messi’s absence as a crutch, but instead, use it as a launch pad to shine in his absence. Previous PostBarça defeat Sevilla 4-2 but lose Messi for 3 weeks. Next PostBarça remain perfect with 2-0 victory over Inter.